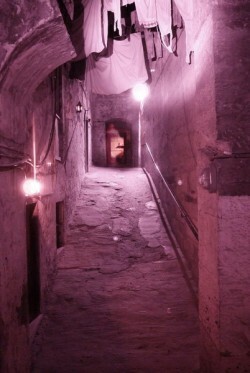 Edinburgh’s premier underground attraction, The Real Mary King’s Close, has got a reputation for being a rather haunting place at the best of times, but this June, the costumed guides will be asking late-night visitors if they are brave enough to venture into the hidden street with the lights turned off. Launching on 30 June – coinciding with the premier of the Disney Pixar movie ‘Brave’ as part of the Edinburgh Film Festival – the ‘Brave Enough?’ tour will take place at 10.00pm each Saturday throughout July. Although the content of the tour will remain much the same as the normal visitor experience, there will be one fundamental difference; the lights which illuminate the underground attraction will be turned off, with only flickering candles to guide the way. The Real Mary King’s Close takes visitors into some of the hidden streets that are buried beneath modern Edinburgh. Largely unchanged since the 17th century, these streets tell a unique story of Edinburgh’s past – a time capsule of life as it used to be in the Old Town, just steps away from the bustling Royal Mile. Visitors are given a tour of the street accompanied by one of five costumed guides, each with their own unique perspective on life in Mary King’s Close, from the poet and chamber maid to the foul clenger – the man charged with cleaning houses affected by the plague.